I really had no idea what the end results would be when I started the project, but here it is. 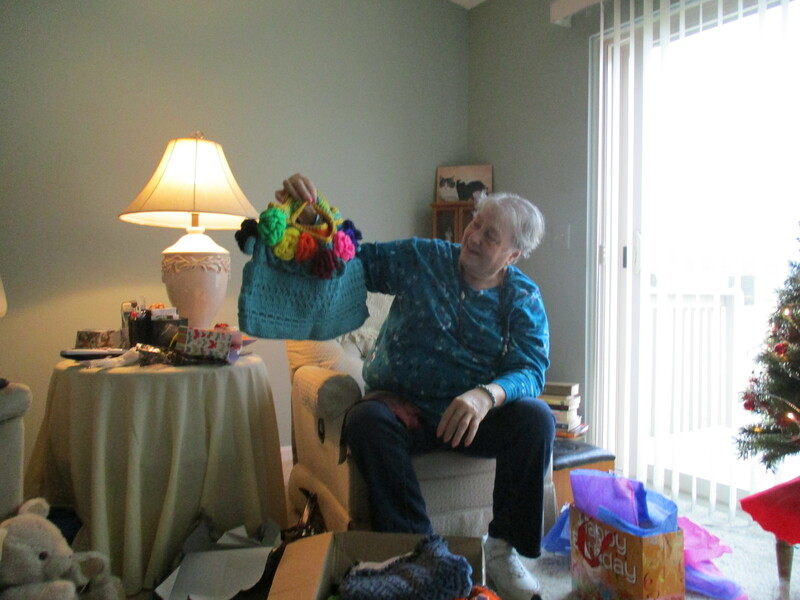 I decided to make Aunt Donna a homemade birthday gift, and I’ve often seen her using reusable shopping bags, so I thought maybe a big bag would be something she would like. I read through a few patterns before starting just to get some idea of how to crochet a bag. I went through some of my yarn and found one that I thought I had enough of and then I began. After crocheting the bottom of the bag I was getting bored doing the same stitch over and over, so I began to experiment with some new stitches. On the sides I changed stitches every two or three rows. When I got to the handles I decided to crochet with two strands held together in order to make the handles stronger. Since I only had one skein of the color I was using I needed to add a second color. I’m not sure why I chose yellow, but by this time my husband had noticed what I was doing and he thought that adding more color was a great idea. After I finished off the handles and the bag was basically complete I realized I needed to add something to hold down the flapping circles, near the top, that were a result of one of the new stitches that I tried. In order to add more color and hold down the circles I decided to make flowers and attach them to the bag. Since I was crocheting in the evening while we were enjoying a fire in the fireplace and listening to music, I decided to join my husband for a drink. When I finished crocheting the second flower I realized that I had crocheted it backwards. It still looked like a flower but did not match the first one I made. At this point I thought, “not all flowers look alike,” so it made much more sense if all the flowers were different than if they were all the same. I poured another drink and continued making flowers. Even though I didn’t finish them all that night, and the rest were finished while I was not under the influence, I continued to make them all different. After I finished attaching the flowers, I knew that the bag needed a lining. I pulled out a piece of fabric that I thought would work, and since sewing is definitely not one of my strong points and pattern design is something I know nothing about, I let it sit on the table for nearly a week. Two days before Aunt Donna’s birthday party I knew I had to bite the bullet and finish the bag. So I took some measurements and drew out a pattern on freezer paper. I cut it out and pinned it to the fabric. Then I cut out the fabric pieces and sewed them together. I can’t say how well the lining actually fits inside the bag because, being inside, it was difficult to see. It seemed to work though. I hand stitched the lining around the top edge of the bag. These stitches were far from perfect but they seemed to hold the lining in place well. After it was completely finished (or so I thought) my husband suggested and I agreed that the handles needed to be reinforced. I selected a heavy weight yarn in a gold color to crochet around and reinforce the handles. The end result is a Ruth Ciani original. It is definitely one of a kind, and I can assured you that it won’t be duplicated, because not even I could do it if I tried. I did have a lot of fun making it, and I hope Aunt Donna will have as much fun (as I said to my daughters) embracing her eccentricity and carrying this bag. It was a great experience. We find it refreshing to see this type of store open in our area. The owners were very nice people, there was a good variety of products for sale, we felt the prices were quite reasonable, the bread we bought is fabulous, and I found a new source for coconut oil. We will definitely be shopping there again. I hope you will support this local business as well. Just one week before Christmas and our Christmas Tree is finally up. It’s not because I’ve been too busy, lazy or procrastinating that it’s taken so long. It’s because I love the tradition that we have for putting up the tree. I’m not sure when it started, but it was sometime over the last fifteen years. 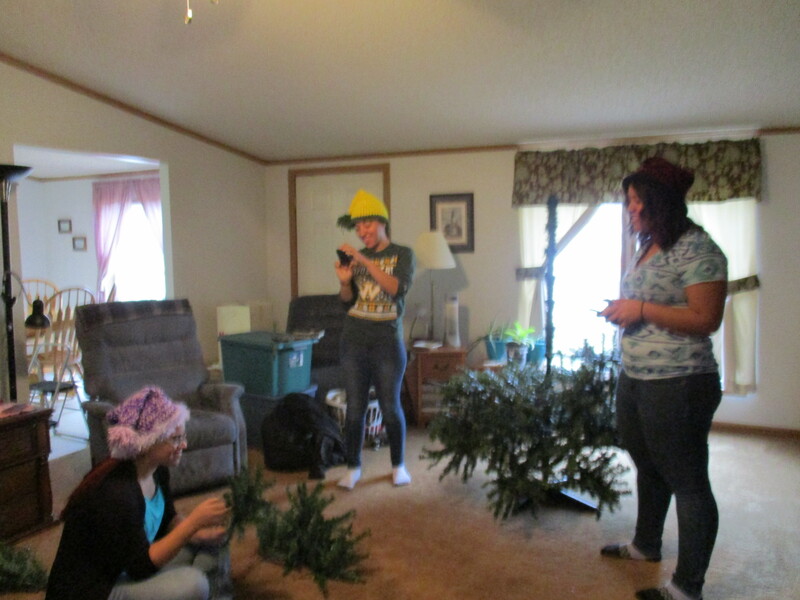 My four daughters and I put up the Christmas Tree together. With the girls all living on their own now, and having to schedule around their work and college commitments, it has become more difficult to find a time when they can all get together. We have been trying to coordinate a time for this since Thanksgiving and I had even entertained the thought that I might have to put the tree up by myself or maybe just not put the tree up at all. Finally the time was set for noon yesterday that they would all arrive for the task. As it turned out only three of them made it because Hanna was not feeling well (some things you just can’t plan for). While there were all ready a lot of specifics to our tradition of putting up the tree, I decided to add to our fun. My sister had sent me a crochet pattern for a Santa hat. It was a cute hat but I really didn’t think I had any reason to make it so I had just filed it away, but for some reason on Tuesday I decided I would make elf hats for the girls. Since I didn’t have yarn in traditional Christmas red and green, I decided to use what I had. I started crocheting and completed the first one Tuesday night and finished up three more before bedtime on Wednesday. Then I realized that the girls would probably say “Mom, where is your hat?” So yesterday morning I dug out some more yarn and stitched up one more elf hat. I was still finishing it up when Tina (elf # 1) arrived but had it finished before (Kara elf # 3) and Lindell (elf # 4) arrived shortly after noon. 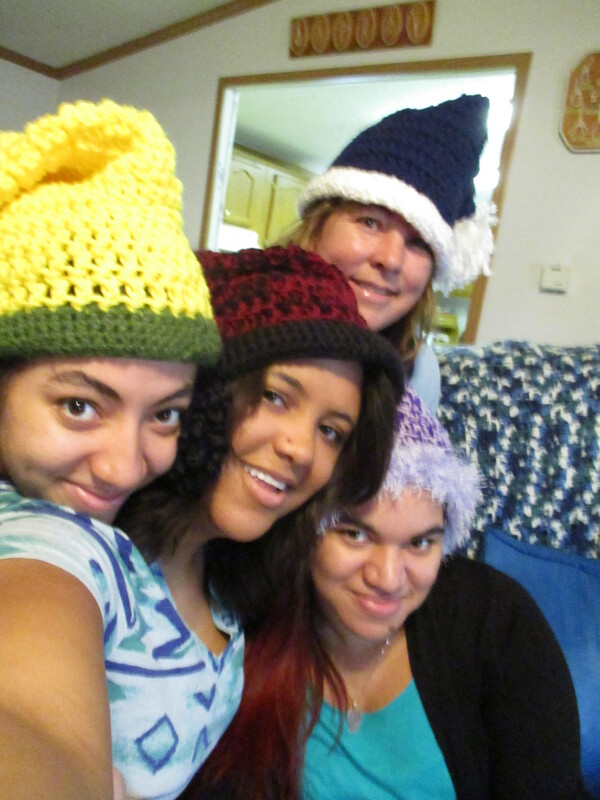 When I made the hats I had an idea of which hat would go to which daughter (elf) but I decided to let them pick their own. I decided to let them choose in the order that they arrived, so Tina picked first as she arrived before noon and waited quite awhile with me before the others got there. 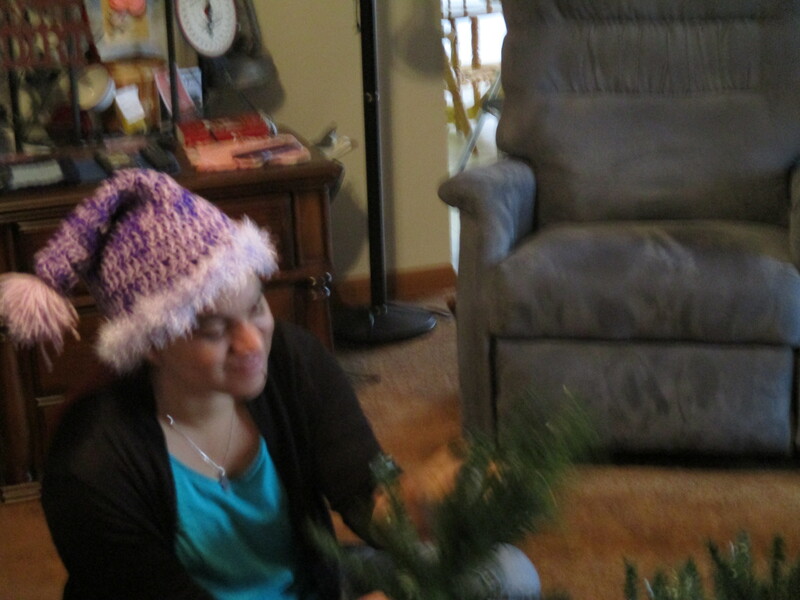 Tina, who is a fashion designer, and loves colorful patterns, chose the purple hat. I was happy because I had her in mind when I made this hat. Lindell arrived next. I was disappointed to see that she was alone because she was supposed to pick up Hanna (# 3 elf) and bring her along. Lindell got next pick and she took the red and black one. 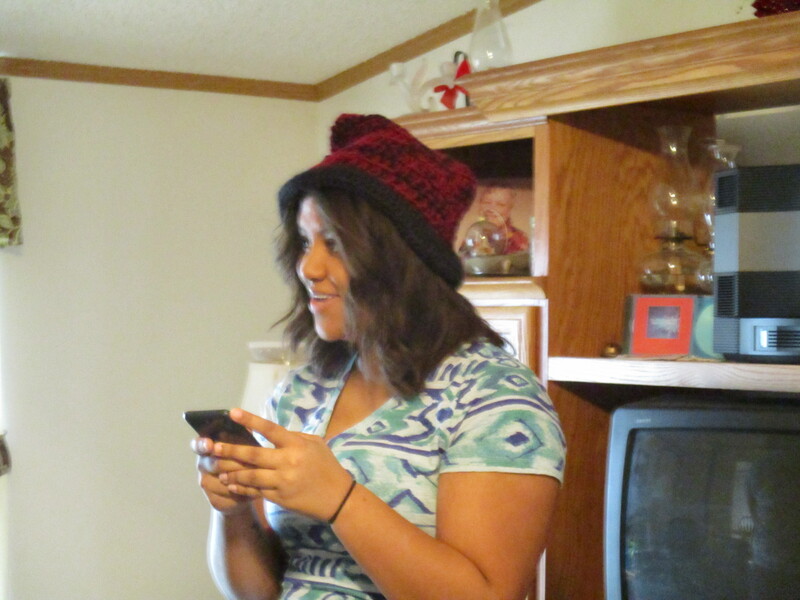 This is actually the hat I had in mind for Hanna, when I was making them but it looked really nice on Lindell. There was no doubt in anyone’s mind which hat Kara would pick. I made it specifically in Wayne State colors with Kara in mind, and even though she didn’t get first pick, her sisters knew it was her hat and would not claim it for themselves. I then asked one of the girls which of the remaining two I should have and she said the blue one, probably because I was dressed in all blue. By the time Kara arrived 20 or 30 minutes after noon, we had already begun the tree assembly but there were still plenty of branches that needed to be unfolded and “fluffed” as they called it, and then installed on the trunk. The girls have become very particular about the way the branches are fluffed and placed on the tree. After the tree was put together it was time to put the lights on. This is where we really missed Hanna. It is her job to help me with this. After we plug in each strand to make sure that it works, she stands on one side of the tree, and I stand on the opposite side. We start at the bottom of the tree and I hand the strand to her, then she hands it back to me as we wrap it around the tree moving upward as we go. Kara and Lindell both took turns filling in this position, although they are not nearly as proficient as Hanna, the lights were successfully put one the tree. After the lights go on the tree comes a very special part of our tradition. Many years ago I purchased a collection of Snow Angels Christmas ornaments. I don’t have a complete collection and I’m not sure how many there are total in this series or even if the still make them. I do have about 30 of them and each one has a tag that says Blessing of ___. Some examples are Blessing of Hope, Blessing of Love, Blessing of Jubilee, Blessing of Patience and Blessing of Coyness. These are the ornaments that get placed on the tree before any others. While I unpack these “blessings” I will read the tag and select one of the girls to place it on the tree. Sometimes I give it to the girl I think has that blessing or a quality and sometimes I think it is a blessing that the girls needs. The blessing of Slumber for example has mostly gone to Tina or Lindell who both love to sleep the day away, but this year it went Kara who has pulled two all-nighters in the past week due to exams and projects that are due before the semester ends. Once the Snow Angels adorn the tree, the girls hang the rest of the ornaments that we have collected over the years, many of then have their names on them or were acquired in groups of three or four like the three Christmas Dinosaurs or four Christmas Dogs. Lastly the angel is placed on top of the tree. I usually do this but had some help from Lindell this year. As I told the girls to put all of the packaging back in the bins, I noticed the tree skirt and said someone needs to put that around the tree. 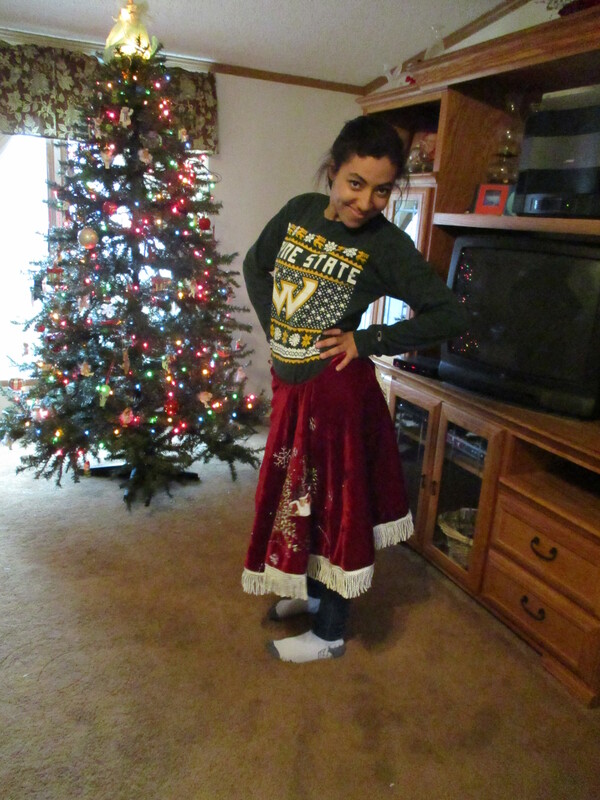 Kara said she would “dress” the tree in it’s skirt but decided to model the tree skirt first. Once the we were finished and the packaging was put away we all posed for a picture taken by Elf # 4, with her long arms and being trained in digital media. Then we enjoyed some homemade chicken soup that was prepared, with love, by my husband for our tree decorating elves. 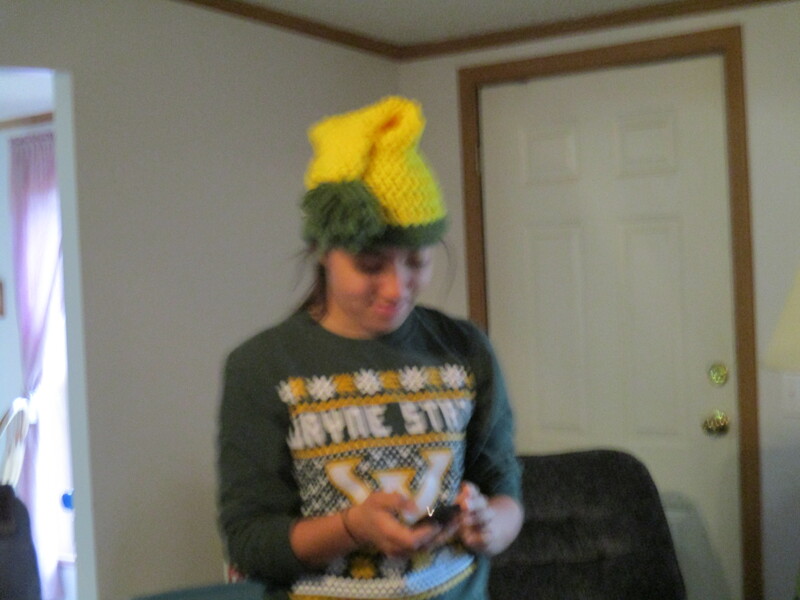 As each of the girls left I made sure they were wearing their elf hat. I told them that I hope that they would wear them and embrace their eccentricity or maybe just indulge mine. I don’t know whether the girls will wear them again this year, but maybe they will become part of our Christmas tradition in future years. As always I think the tree looks beautiful, and this year despite the lack of snow and the unseasonably warm temperatures we have had lately, it is beginning to feel a little like Christmas. On Friday I was invited by my Aunt to visit KIDS, an all volunteer organization, where she has worked (volunteered) for several years. This organization is amazingly run and does great work in our community by helping families (kids) in need. You can check out their website here http://kidsindistressservices.org/ . I arrived shortly before they closed for the day and set up my store in their lunchroom. As the ladies finished they were able to come in and shop for soaps, balms, lip balms and the very popular, key chain lip balm holders. I believe this was a win-win experience. While I enjoyed selling my products, I believe it was nice for these busy ladies to be able to shop, whether for Christmas gifts, or for personal use, right there at work. I want to thank them, again, for letting me introduce them to my products, and pray that all of the products are a blessing to those who use them. Recently my husband and I have been watching episodes of the Beverly Hillbillies on ME (Memorable Entertainment) TV as we enjoy our breakfast in the morning. I guess you can say we like a “heapin’ helpin’ of their hospitality” with our breakfast. On one episode, earlier this week, Ellie Mae was carrying a tray of Grannies homemade lye soap, as one of them there city fellows arrived to invite her to a party. He looked at the soap and asked if it was homemade. When she replied that it sure was. He asked if he could have a piece, she said “sure” and he took one from the tray. After they finished their conversation, and she walked away, he bit into the soap and with a strange look on his face said, “she sure make terrible fudge”. As you can imagine my husband and I got a big kick out of this. Suffice it to say that this is a scene I will remember.